Please help me improve this blog entry. I know it’s not perfect but it’s a news item many Nepali nurses are interested in. preparing the banner for the march. If your plan is to study nursing in India, then work in India or go to a third country such as Oz, watch this video. Click here. Or click here for another one. Please share these. It is especially important to share this with young people thinking of going to India, before they spend any money. Because I go back and forth from USA to Nepal, nurses ask me about working “abroad.” (to see what I have written, click here). Turns out that many young women study nursing because they hope to get out of Nepal, and go to India, UK, EU, Oz, or – anywhere. I have noticed that since the blockade these are getting more hits. I will write about this in some future blog. At this time there are said to be 10,000 Nepali women per year graduating from nursing in various Universities in India. Since each program takes at least three years, this adds up to 30,000 people affected. I recently learned about a new problem. See the letter below. Here is the letter from the India Nursing Council. This issue extends back in time well before the blockade. 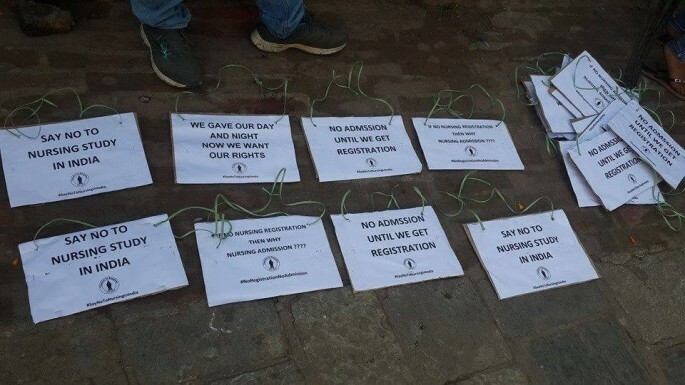 We are deeply concerned with the reports that Nepalese nursing students graduated from Indian Nursing colleges are denied registration by Indian Nursing Council. This is clearly a breach of “1950 India-Nepal Treaty of Peace and Friendship” that grants the Nepalese and Indian citizens to live and work in either of the country. 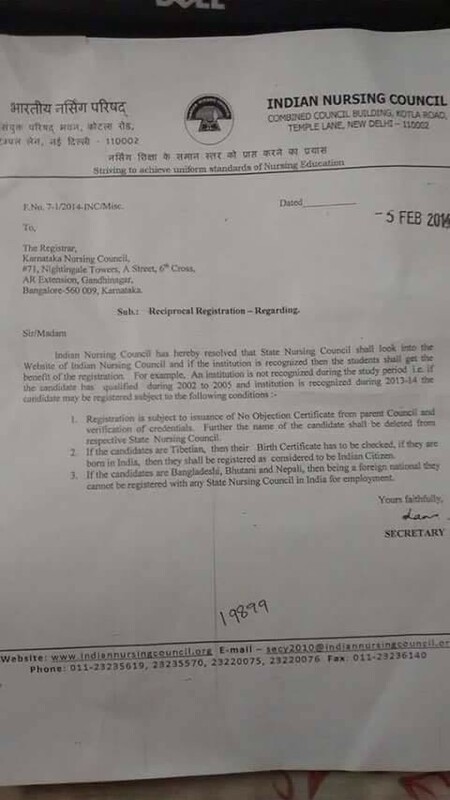 Thus, by denying the registration, Indian Nursing Council has barred Nepalese nursing students from pursing Nursing career in India which is totally against the aspiration of the treaty. Also, without registration from parent council, Nepalese nursing students who have graduated via Indian nursing colleges are unable to apply nursing jobs abroad and thereby are restricted from pursuing career abroad despite of meeting all the other parameters. 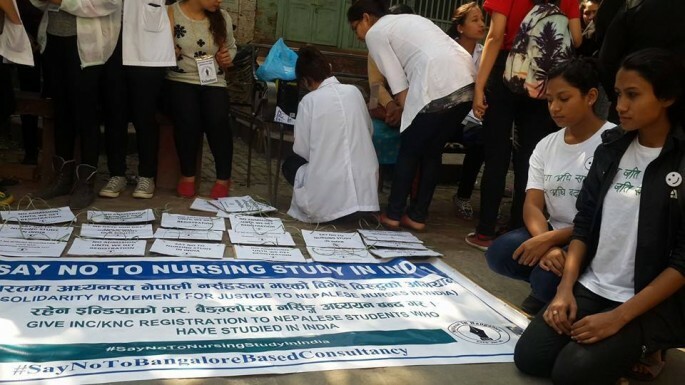 A protest by Nepali nursing students in Bangalore, India. India has been a lucrative country for Nepalese students to pursue their study and nursing, top the list. This has not only given an opportunity for Nepalese students to acquire best education but also has opened up business opportunities for many Indian institutes, and the new provision, barring Nepalese nursing students from getting registration will surely jeopardize the business opportunities that nursing colleges from India are enjoying so far, as such discriminatory provision will discourage Nepalese students to prefer India for nursing hereby. Nepal-India relationship has been very special in every aspects and are two very reliable partners from the region, who have strong potentials of working together in making the region a better place. The growing demand of healthcare workers in both countries can only be fulfilled by respecting and acknowledging the value of these healthcare-related students and discovering the ways to assimilate them, which anyway Nepal-India treaty of peace and friendship guarantees. So, this is our humble request to concerned authorities and departments to respect the century-old Nepal-India relationship, diligently adhere with the provision of 1950 India-Nepal treaty that guarantees equal job opportunities for both nationalities, willfully acknowledge the importance of Nepalese nursing students and value their skills and potentials, and weigh this sensitive issue wisely and pragmatically and do the needful. placards used in the protests. The nursing students wrote letters to the Nepal Nursing Council and the Nurses Association of Nepal. Click here to read it. 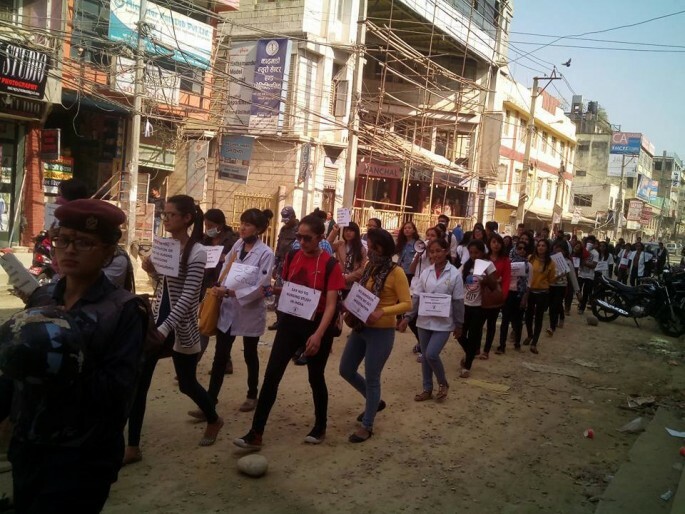 Will the Nepal Nursing Council help? I was previously aware that the Nepal Nursing Council was not enthusiastic about granting Nepal nursing registration to newly-graduated Nepali women who wished to work here. One person from NNC told me “Those schools in India are not as good as Nepal nursing schools. Not enough practical.” The NNC has not made it easy. 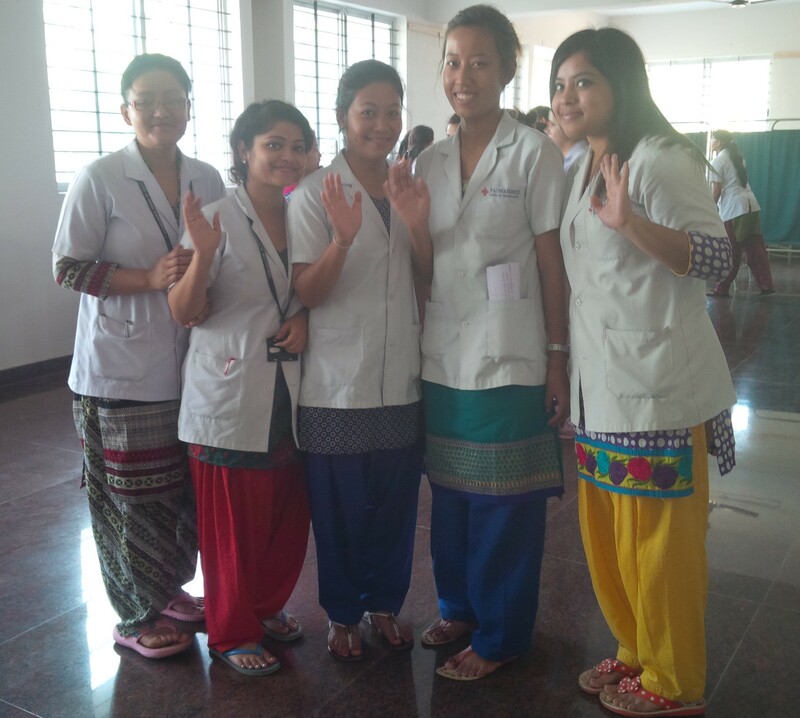 Historically, there are many nurses in Nepal who attended nursing school in India – and who are in fact, Indian citizens. (more of these work in Terai. Nurses from most parts of Nepal speak at least a little bit of Hindi). Will the educational consultancies in Nepal help? This is a good question. One person in the discussion said she thought the consultancies on Putalisadak, where many people go for career advice, do not wish for this to become widely known, since it will affect their profits. Will the Nepal Government help? The Nepal government presently has other more pressing diplomatic problems to discuss with the India government. Somehow I worry that they are not in a position to advocate for Nepali citizens working or studying there as effectively as in the past. It occurs to me that no Nepali journo has explored what’s happening to Nepali people in India these days. In November 2014 on my epic India trip, I was invited to teach at a school of nursing in Bangalore. At this place they were not so rigid about identical uniforms. I enjoyed the colorful Punjabi outfits. The students were smart and enthusiastic and reminded me of USA students. Please share widely. I am likely to edit this and improve it with feedback from people who have personal experiences or who are involved in addressing this problem. This entry was posted in medical volunteer in Nepal, nursing education, south Asia and tagged India Nursing Council rules about Nepali nursing graduates, Indian registration for Nepali nursing students, Nepal nursing, Nepali study nursing in India, Nepali studying nursing in Bangalore India, nursing schools in India. Bookmark the permalink. Thanks. I will update the original piece. I appreciate!